Hello again! The calendar says it's August 3, but it feels like I just got back from Tulsa! Linda from Chessie & Me fame and I were invited by Lindy of The Silver Needle to be the teachers at the annual Summer Stitching Event, and it was absolutely fun-filled and energized and fabulous! And spending time with Linda was wonderful; she's a talented, lovely teacher, and I'm privileged to call her my friend. And I didn't get one lousy picture of her project. But don't tell her. Actually, I didn't get a picture of mine either, but that's because I knew what it looked like. But I did take a picture of it for the cover of the chart before I left, thank goodness. In the last few blog posts, I included a tour of Lindy's shop, and today I'd like to share just a few pictures from the actual class with you. The class was held in an open space in the building around the corner from The Silver Needle shop. The temperature outdoors was at least 426 degrees Fahrenheit, and it was during high noon on Day One that Linda-from-Chessie and I decided to head over to the classroom. It took us about a half hour to get there. Not because were were enjoying each other's company so much that we had to shoot the breeze (there was no breeze) in the parking lot, but because we went in the opposite direction of where the classroom was, and ended up walking around the entire plaza before we got our bearings. Thankfully we were not eaten by coyotes, but I guess at high noon in an open parking lot in a super bustling part of town, that's not likely to happen. But you never know. Anyway, we made it to class and as soon as our pulses returned, the retreat went splendidly. If you ever get the chance to attend the retreat in Tulsa, come hungry. 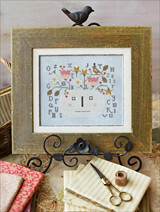 One of the ladies there was working on this breathtaking Scarlet Letter sampler... I was completely gobsmacked. On Saturday afternoon, the attendees started packing up and heading back to their homes, and we all said goodbye. Lots of new friendships were formed, and it was so much fun getting to put faces with Instagram names, meeting FlossTubers, and watching Facebook groups reunite. If you ever get the chance to go to the Summer Stitching Event in the future, don't pass it up! I had so much fun, and I am grateful for the opportunity to have met all of you who attended. After the classroom was broken down - trash out, tables folded, chairs stowed, charts and models boxed, tablecloths shaken out, and cars loaded, the staff and Linda and I headed to Lindy and Craig's house for a huge barbeque and lots of laughter. I did take one parting shot before I got in the car, of Lindy and Craig's fabulous front door. I begged them to let me take it home with me, but they politely refused me. Isn't it great? They certainly knew how to build houses and doors back in 1928. Thank you for stopping in for the last leg of the tour. Hopefully you'll come back by soon to see the pictures from the Pioneer Woman Mercantile. All I can say is swoon! And here is the little acorn project and pincushion for the welcome night... you can hardly see the little acorn, but it's there! Sweet Rindy Richards told me that she saw my Shepherd's Bush class piece on the net today, as Sue Ream (Hi, Sue!) had stitched it... and that's when I realized that I've never shown what my class piece was! My friend-and-framer Sherri Berkman was the model stitcher for this one (hence, the SB initials at the bottom, which several people thought stood for "Shepherd's Bush"), and once again, she surprised me with the moulding. I could not have asked for a more beautiful frame to go with this piece, which features a rabbit dashing through the woods, and crossing over a narrow thread of river. :) The retreat's theme, as you may remember, was "Over the River and Through the Woods," and I loved how each of the teachers interpreted it.. what a warm and cozy theme it was to work with! 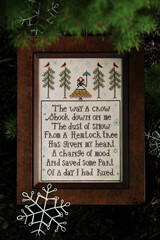 The little scissors fob to the bottom left corner of the model was also stitched by Sherri as a surprise to me. I was so thrilled to receive it, and will always remember her kindness and generosity, as she was going through a very difficult time in her personal life when this model was being stitched. I'm so touched that she would do that extra thing for me.. both sides of the fob are stitched over one linen thread (the reverse side has an acorn and leaves taken from the design). Thank you so much, Sherri. It meant so much to me. 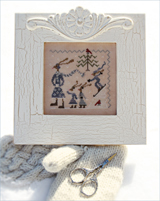 The scissors attached to the fob are the gorgeous work of Paula Sibbald from Kelmscott Designs.. I begged her to come up with something special for my class kits, and her response to me was, "Well I was just working on a new pair of scissors, and wasn't sure what I'd put on them!" This was certainly good news for me, and she took my "OH PLEASE DO ACORNS, PLEASE DO ACORNS" to heart. Thank you again, sweet Paula! They turned out beautifully, and I was thrilled to be able to include them in my class kits! I suppose the rabbit is now crossing a frozen river through barren trees at this point, as fall has moved on to another year. And as usual for me these past couple of years, I'm running behind it, hollering, "Wait! Wait! I've been so busy, I never got to say goodbye!" Because of this busy-ness, I decided last month that I wouldn't release any new designs for the remainder of 2014, but rather I would take some time and enjoy the season for a while. My next releases will be in Nashville in February. I truly hope to see lots of you there, and I hope it will feel like Christmas all over again, only with spring colors! Now, I think I'll go ask God for some snow, because that truly is one of His winter gifts to us - especially when topped with a red cardinal. I have no idea why I don't post photos when they're freshly-taken, but I tend to stay away from my computer for long periods of time. Every day I think to myself, "I really should post the Shepherd's Bush retreat pictures," and every day I put it off... again, my hip issues hamper my enthusiasm for blogging! I'll just start posting in no particular order... you've most likely seen all of the projects and boutique designs presented here, but just in case you suddenly get the urge to add one or two to your Christmas Wish List, then I will be thrilled that I posted them! The famous sisters... one can't help but be very happy around these two! ... but when I saw who was sitting across from them, I immediately knew. Anywhere these amigos are, there is bound to be a lot of laughing! Here they are, and such lovely friends! I had so much fun being around them! Their stories and tattle-tale adventures are quite hysterical. Another close-up of Chessie and Me's class piece... stunning! 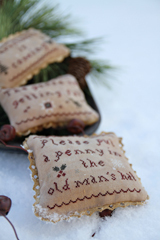 The Giving Season pinkeep (pictured above) was part of R&R's class.. here are some closer looks at their main sampler. Again, I've got several photos missing that show these outstanding class pieces in all their glory! I'm so disappointed! Okay, I have to admit that I was sorely tempted to stitch this using Shepherd's Bush's conversion and the JABC buttons - not to mention the outstanding frame job that Jill Rensel did on it! The pincushion exchange for the heifer project was a huge success! What fabulous little works of art! I love this picture.. she found something awfully surprising! One of the attendees stitched one of the mini pieces from my class while she was there (so fast!) and had some of the teachers sign it with a Sharpie, which I thought was such a fun idea! We were all nervous about putting permanent marker to linen, but it all worked out beautifully! The 2014 Shepherd's Bush retreat was a highlight of my year! It was such a wonderful time spent with old friends, new friends, lots of stitching projects, and the beautiful scenery, all at the Canyons Resort in Park City. My hope is that Tina and Teri will continue this every-other-year tradition, as it wouldn't be an every-other-year without it. :) I'm so thankful for the time I spent there. What a fantastic time I had last weekend at the Inspired Summer Seminar! It was one of the best times I've ever had, meeting so many new friends and visiting the gorgeous Inspired Needle shop, owned by Cathy Roginela. She was the most perfect hostess, and everyone had such a fun time. I've never seen so many fibers in one place! 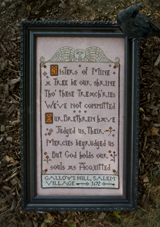 Cathy had the most wonderful thread-minders made, modeled after the flag star in the sampler, and with the weekend's inscription on the flip side! It was such a lovely day, and if she holds another workshop, I'd highly recommend attending! Thank you to Cathy and to each person who was able to attend (we had 52 stitchers there!) for being so warm and welcoming to me. I'll never forget the fun I had with you, and I look forward to hopefully visiting with you again some day! I've been MIA for so long, I almost forgot how to sign into my blog. But there has been a very good reason for this... since returning from Colorado, I've had this insatiable desire to overhaul my entire house! New paint in every room, new blinds on every window, a new stitching chair in every room (okay, just one room), and new carpeting everywhere, which will arrive in a couple of weeks. I'm not sure if this mission I was on was due to the fresh mountain air or simply from being with friends who give me lots of positive energy, but whatever it was, I'll take it. The smalls I designed were based on the sampler, and I called them A Crowning Effort. Judy Yunt and Katrina Devine did the most amazing job putting this workshop day together for the ladies, and I can't thank them enough for the honor of being invited to attend. The decorations were beautiful (which included fresh flowers in beautiful blue Mason jars at every table! ), the gifts given to every single attendee were outstanding (stitched scissors fobs - 65 of them, front and back stitched! 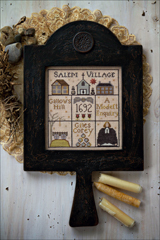 - black Kelmscott Storklette scissors, and beautiful beeswax crowns), and the door prizes were absolutely fantastic (Lady's Trimkeeps and stitching wallets - again, stitched by the sweetest, most generous ladies - sampler charts, and so much more!). And the food! Absolutely delicious, and I think every single person there needed one recipe or another. After the workshop was over, I stayed a few extra days at Katrina's house, along with good friends Natalia and Karin (and we got to visit Jen's house for a stitching day as well!). We had such a fun time chatting endlessly, eating everything Katrina cooked (because everything she made was amazing), and "shopping" in her stash room, which holds more kitted samplers and Natalia's stitching wallets than you can imagine. And did I mention that everything was organized by designer, and then alphabetically? And by the way, for those of you on Instagram, you can follow Katrina as she works on her Crowns Sampler, and see the color changes she's made. It's coming along beautifully, and if I were to stitch this sampler again, I'd go with her conversion! What a lovely time I had in Dallas! I can't express well enough how warm and welcoming the ladies and gentleman of the Tudor Rose Sampler Guild were. I found myself wishing I could come to every one of their meetings, just to spend more time with them all. I say "some" of the guild members because I couldn't fit the entire room into my camera! We had a full house, and it was a lot of fun. I am so happy I was invited to spend the day with all of you. What a joy it was to have gotten to meet you and chat with you and just spend the day doing what we all love to do. :) Thank you so much for making it such a fun day for me! I sure hope it was fun for you too.